Soft tissue sarcomas are rare neoplasms often characterized by local invasiveness and distant metastasis with poor prognosis for affected patients. Among the most frequent sarcomas we find well-differentiated and dedifferentiated liposarcomas characterized by a better survival compared to the other histological types. When it is possible the only curative treatment for these neoplasms is surgical resection. 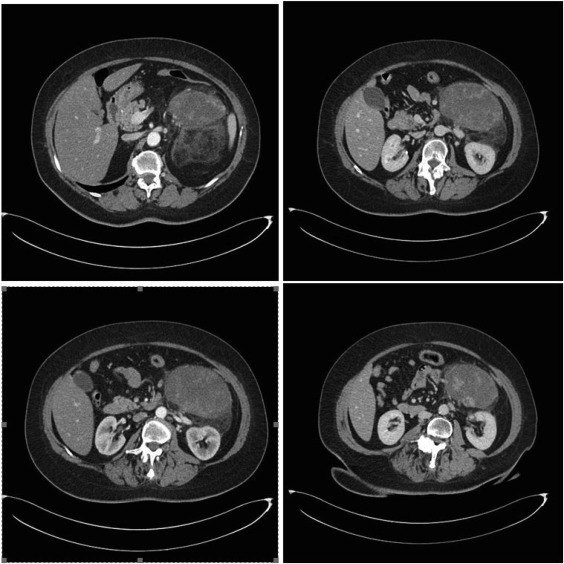 International Journal of Surgery Case Report, reports a case of a 62-year-old caucasian woman with CT abdominal scan that demonstrated a voluminous solid oval mass in the left perirenal space with dislocation of the kidney and in continuity with the anterior renal fascia. After a percutaneous CT-guided biopsy of the mass the histopathological diagnosis was a dedifferentiated retroperitoneal liposarcoma. We performed a laparoscopic surgical resection of the retroperitoneal mass in block with kidney and left adrenal gland.